Have you noticed how the celebrities these days seem to be looking younger and younger? There is Monica Bellucci. Does she even look like a 46 year old? Age has become just a number. The lovely ladies of the large screen have figured out how to age graceful and have young skin no matter what their age. The secret lies in their smart makeup choices, healthy habits and some other tips put together. That is exactly what you need too. With some smart lifestyle choices and a few other things taken into consideration, you too can manage to keep your age as just a number! As you pass the years, you start seeing fine lines around and on the lips. These are one of the first signs that your skin is beginning to age. Use foundation on your lips and then coat it with powder to fill in those lines. Remember to not use too much of lip gloss. The lip gloss will make your lip stick bleed into the lines in your lips. As you grow in age, the facial hair that may have been quite light and scant till now starts getting more prominent. In some cases, it turns darker, in other cases it can get thicker and more prominent. Make sure you go for regular visits to the parlour to take care of your facial hair. Always keep a pair of tweezers handy as this will help you remove any unsightly strand immediately and anywhere. Waxing tends to loosen up the skin, making it sag easily. This can be quite an issue as you age progresses. Going for alternate hair removal methods are always a better choice. As you age, your eyes and skin tend to look a bit dull. So it will need a little help to bring back that glow. Beauty is something that is complimented with grace. The idea is to look beautiful and graceful no matter at what age, not try and dress like a teenager. Your main focus should be on looking naturally healthy and poised. So, the makeup choices that you do should be more towards creating a natural look rather than a put on look. Use more of browns and dull metallic shades in your makeup. If you have small or dull eyes, prep them well and make sure you use shades that open out your eyes. Stay away from neon colours or shades like hot pinks or ones that are too bold and loud. Dry skin shows signs of ageing much faster and turns lifeless and dull. Help your skin regenerate itself and sustain its elasticity longer. Scrub and moisturize your skin well on a daily basis. Don’t use too much foundation, concealer or primer as these will end up clogging your pores. Always drink a lot of water and eat fresh fruits and vegetables. A good lifestyle always shows on your skin!! 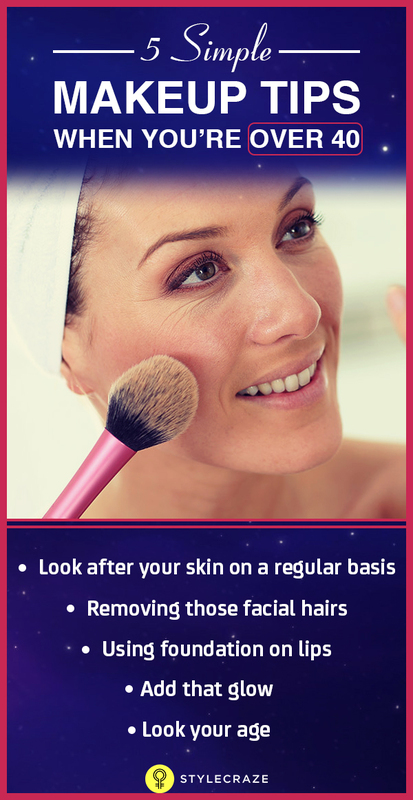 So make sure you adopt a healthy lifestyle along with the above makeup tips. Look good! No matter what your age!